Description: Meet nature expert Tom for a family-friendly night time exploration in and around the castle ruins. Learn about the amazing bat species who call Purbeck their home and see how many you can spot along the way. Start at Castle View Visitor Centre and enjoy a tasty hot chocolate when you reach the castle entrance. 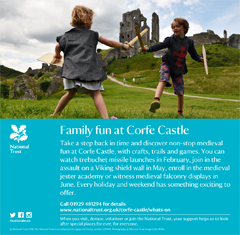 (£6 per person, booking essential) Please let us know you saw us on What's On in Dorset! Certain events attract an entrance charge and may need to be pre-booked. We strongly recommend that you confirm the details with the organiser, venue or Tourist Information Centre before you make your plans. Whilst every effort is made to ensure the accuracy of the details within this guide, dates, times and venues may change or events be cancelled altogether. The publisher cannot accept any responsibility for any such changes or for any errors or omissions which may have occurred.